MasterTheCase is the only case interview preparation resource that covers all seven preparation areas. They form the basis of our extensive video tutorial curriculum, described in detail below. This case interview tutorial will teach you Industry Analysis. It is a key Strategy tool used to assess industry attractiveness and its impact on business performance. The key topics include the determinants of a firm’s profitability, five forces of industry structure, non-structural macro factors, and industry-analysis process. This case interview tutorial will teach you Competitive Strategy. The key topics build on the concepts from the Industry Analysis video and include competitive advantage types, generic competitive strategies, unique value proposition, and tailored value chain. This case interview tutorial will teach you the Profit Equation. It is the underlying Economics concept in major types of consulting cases, reflecting the fact that profit maximization is at the core of business strategy. The key topics include the main profit, revenue, and cost drivers, and their structured analysis in case interviews. This case interview tutorial will teach you Cost Segmentation. The key topics include main cost-segmentation criteria and a detailed analysis of variable and fixed, recurring and one-time, and primary and support costs. This case interview tutorial will teach you Break-Even Analysis. The key topics include the economics of break-even and the five key break-even metrics, consisting of volume, price, variable cost, fixed cost, and time. This case interview tutorial will teach you Synergy Analysis, which is often central to solving M&A as well as New Initiative cases. The key topics include the drivers of synergy, revenue synergies, and cost synergies. This case interview tutorial will teach you Expected-Value Analysis, which is an advanced tool for evaluating alternative business options with different outcome probabilities and risk profiles. The key topics include accounting for risk in business-option selection and performing six steps of Expected-Value Analysis. This case interview tutorial will teach you how to analyze Income Statement, a core financial report. The key topics include a review of the income statement function and a detailed analysis of income-statement items. This case interview tutorial will teach you how to analyze Balance Sheet, which, along with Income Statement, is a core financial report. The key topics include a review of the balance sheet function and a detailed analysis of balance-sheet items. This case interview tutorial will teach you Time Value of Money. The key topics focus on efficient discounted cash flow analysis and include the stable and growing perpetuities, Rule of 72, and lifetime customer value. This case interview tutorial will teach you how to analyze Capacity as it relates to Production and Operations Management. The key topics include the capacity definition, primary drivers, and link with the value chain. This case interview tutorial will teach you the Marketing Mix, which is the customer-facing strategy element. The key topics include the mix structure, link with strategy, and a detailed review of the mix components. This case interview tutorial will teach you Pricing, which is the most quantitative component of the Marketing Mix. The key topics build on the Pricing concepts from the Marketing Mix video and include four major pricing methods, pricing triangle, and buyer price sensitivity. This case interview tutorial will teach you Structured Communication, which is fundamental to case interview success. The key topics include the pyramid structure, assertion qualities, and supporting-rationale qualities. This case interview tutorial will teach you Structured Case Analysis. The key topics include the five main steps in the "answer-first" hypothesis-driven approach to problem solving used by top consulting firms, which forms the basis for MasterTheCase case frameworks and practice cases. This case interview tutorial will teach you the 80/20 Principle, with a focus on its application in case analysis. The key topics include identifying and prioritizing key drivers, and three steps in efficient 80/20 analysis. 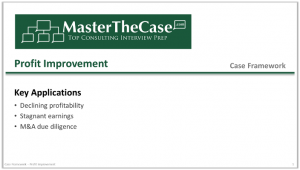 This case interview tutorial will teach you the Profit Improvement Case Framework. The key applications of the framework include cases dealing with declining profitability, stagnant earnings, and M&A due diligence. This case interview tutorial will teach you the Revenue Growth Case Framework. The key applications of the framework include cases dealing with declining revenue, stagnant growth, and strategy change. This case interview tutorial will teach you the Market Entry Case Framework. The key applications of the framework include cases dealing with geo-market entry, product-market entry, and innovation development. 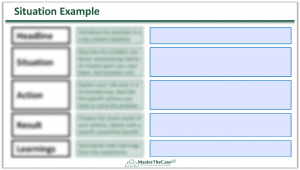 This case interview tutorial will teach you the Asset Investment Case Framework. The key applications of the framework include cases dealing with evaluation of production, real-estate, and infrastructure investments. This case interview tutorial will teach you the Mergers & Acquisitions case framework. The key applications of the framework include cases dealing with corporate M&A, private equity M&A, and initial public offerings. This case interview tutorial will teach you the Competitive Threat Case Framework. The key applications of the framework include cases dealing with a competitor attack, new-player entry, and substitute launch. This case interview tutorial will teach you the Capacity Expansion Case Framework. The key applications of the framework include cases dealing with capacity management, production outsourcing and infrastructure investment. This case interview practice tutorial will teach you how to solve a Profit Improvement case from the cost side of the profit equation. Our client is a mid-sized US chemical company experiencing a profit-margin decline. This case interview practice tutorial will teach you how to solve a Revenue Growth case through identifying profitable opportunities to grow existing revenue streams. 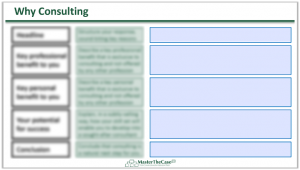 Our client is a UK-based provider of elderly care experiencing a revenue decline. This case interview practice tutorial will teach you how to solve a Market Entry case that deals with an entry into a new geography. Our client is a Polish distiller that wants to grow by expanding into Western Europe. This case interview practice tutorial will teach you how to solve an M&A case that involves a corporate buyer. Our client is a British airline that wants to expand via acquisitions and targets a competitor for takeover. This case interview practice tutorial will teach you how to solve a Competitive Threat case that involves a new player entry. Our client is a leading US plastics maker unsure about its response to a new Asian competitor. This case interview math tutorial will teach you efficient Calculation Techniques. The key topics include rapid methods of rounding numbers, managing zeroes, annualizing numbers, using the smallest common units, and handling percentages. This case interview math tutorial will teach you Structured Case Math. The key topics include structuring full math logic upfront, calculating sequentially, sense-checking vs relevant benchmarks, and synthesizing the result back to the main question. This case interview tutorial will teach you Structured Graph Analysis. The key topics include forming an initial hypothesis, understanding the graph structure and contents, analyzing graph data to test the hypothesis, and synthesizing the analysis findings. This case interview tutorial will teach you Structured Note Taking. The key topics include the primary rules of structured note taking and key habits of effective note takers to facilitate efficient case analysis and engage the interviewer. This fit interview tutorial will teach you Fit Interview Frameworks. 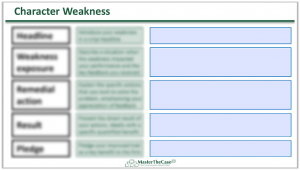 The key topics include the main types of fit-interview questions, key qualities of strong fit responses, and a detailed review of primary fit-interview response frameworks. 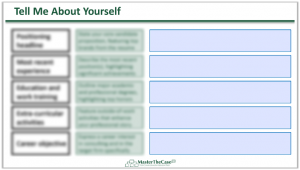 This template will help you develop a structured response to the Tell Me About Yourself fit-interview question, as described in the Fit Interview Frameworks tutorial. The blue input fields are specifically configured to limit your response length to the target time of two minutes. 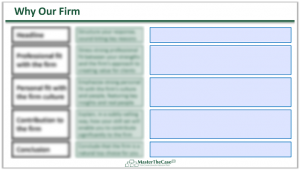 This template will help you develop a structured response to the Why Our Firm fit-interview question, as described in the Fit Interview Frameworks tutorial. The blue input fields are specifically configured to limit your response length to the target time of two minutes. 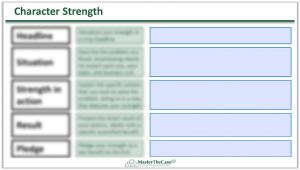 This template will help you develop a structured response to a Character Strength fit-interview question, as described in the Fit Interview Frameworks tutorial. The blue input fields are specifically configured to limit your response length to the target time of two minutes.